Home › House of Destiny › Who is Kim Clement? 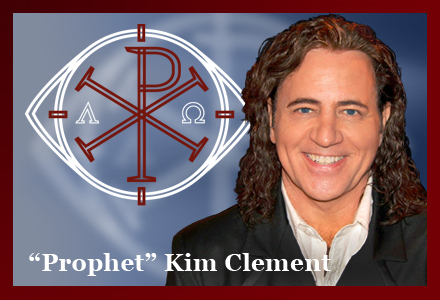 KIM CLEMENT IS A “PROPHET”? It is said that Kim is a “singing prophet”. That is, God speaks and Clement translates “the sound through the music”. Thus he considers that he produces “prophetic music” that “is completely unrehearsed and unplanned”. You get the idea. This guy likes believing the fantasy that he is a prophet. In articles to come – it will be made clear that this man is a false prophet. So who is he accountable to? Well Clement is part of the House of Destiny “church”. However, the unusual thing about this church is that it appears to exist only online. Another unusual feature about this church is that this “prophet” is “the Senior Pastor and spiritual leader” of House of Destiny and “provides the leadership and prophetic guidance for [the] entire online community of believers”. Kim Clement was born September 30, 1956 in South Africa, a nation divided by apartheid. In 1974, Kim had a life-changing experience while dying in a street, overdosed on heroin and stabbed in the chest. This is when Kim became a Christian. Between 1976 to 1978, was a Pastor of Music and Youth Ministry Pastor at various churches. During this time, Kim worked as a counselor in a drug rehab center (Vital Link). He also worked with and trained mentally handicapped children assisting in their co-ordination by teaching music. In 1978, Kim married Jane Elizabeth Barnes in Durban, South Africa. Kim and Jane have been married for 30 years and have 5 children. Kim’s work in his native land culminated in the co-founding and building of the first non-racial church in South Africa, The Lyric Christian Center. This work, established by Dr. Fred Roberts, defied the racial apartheid system and welcomed all races. In 1981 came to the United States to attend Christ for the Nations. Between 1981-1991, Kim traveled throughout the United States, returning 5 times a year to assist at Durban Christian Center in Durban, South Africa. In 1991, Kim moved with his family to the USA. After years of travel and ministering, Kim moved to Detroit, Michigan, and began “The Warriors of the New Millennium,” an outreach to wounded people within the City and eventually throughout the USA. Kim now resides in Southern CA with his family and is pioneering a prophetic outreach called “Secrets”. In 1974, Kim Clement lay dying on the streets of Port Elizabeth, South Africa. A talented musician, the 18 year old had studied classical music through Trinity College months before he had been a finalist in the South African National Yamaha Music Competition, and had just completed a major motion film score. That night, his life drained from a knife wound to his chest. After scores passed by, a stranger picked him up, carried him to his car, and drove him to a hospital. The stranger was a Christian. Through his journey of theology and music, Kim’s travels have carried him to schools and clinics, storefront churches and country chapels. He has sought to break the cycle of hurt and shame that come in the solitary trial of life. To many, Kim is known as the “singing prophet.” If you’ve ever attended a live gathering, you know that music is a major part of the message that Kim brings to his audiences, and at times is the message. From the strike of the first note, the journey begins. Those that listen with their heart know it’s not just praise and worship; it’s prophecy, designed by inspired musical expressions. “God is speaking and we translate the sound through the music” says Kim. There are nights when Kim never leaves the piano, and yet, in the music the message is complete. Another distinct characteristic of this prophetic musical genre, is the spontaneity of this creative emergence, as much of Kim’s musical performance is completely unrehearsed and unplanned. Oftentimes the question is asked, “How is it possible to create such beautiful music without first rehearsing it?” Kim and his musical team are well connected in heart, and this spiritual synchronicity inspires their blend of melodious demonstration. In the midst of Kim and his team finding their way, discovered prophetic truths are proclaimed, while energetic melodies and passionate love songs are born. For many, the result of these inspirational gatherings is life changing. True worship requires an element of faith, and is equally essential in this unpredictable style of expression.Worship is not the way you play an instrument or sing, or even what you sing, it’s the way you touch God. The shouts of warriors antagonize the powers of hell, while we minister to the Lord with our simple melodies and passionate praises. From prophetic gestures, shouting, and singing, to getting on our knees in amazing moments of sweet communion with the Lord, we only want to feel the heartbeat of God. Kim’s gatherings are filled with intense energy and beautiful, spontaneous music. He creates a moment of communion and evocation that breaks down barriers of cynicism and doubt and thrusts the hearer into the reality of their destiny. Through the unique means of prophetic songs, prose, poetry, literature, and dance, specifically expressed through music, Kim takes the hearer into the “presence” of the Spirit and the “communication” begins. The “GIFT” that Kim has been given could be described as the art of apprehending and interpreting divine thoughts, expressing these, and then awakening the faculty of imagination in an individual with descriptive, prophetic music and song. It is the art of idealizing in expression the “moment” that God has created for a human being; the “moment” being their personal encounter with God and discovering His will for their lives. The word, delivered through Kim, will oftentimes heal haunting memories and then by the creative word, thrust an individual into the reality of their destiny. Kim’s prophetic ministry reaches countless people as he travels around the world to reveal the heartbeat of God in tragedy and triumph, good times and bad, war and peace, in democratic or theocratic circles, crossing all cultural barriers by communicating God’s feelings for them. While Kim’s ministry is unorthodox by “institutional standards,” it is firmly grounded in both the Old and New Testament scriptures. The foundations of the prophetic office are detailed extensively in Corinthians, Samuel, and Kings. The prophet is one who sees beyond your present circumstances and gives you access to future events in your life. He refuses to be controlled by your fears, errors, and mistakes, but rather makes a courageous demand on your ability to progress. You cannot do this without a glimpse into the future, which is what the prophet allows you to see. “I believe that Jesus intended His teachings to guide us into an abundant life, while at the same time warning us of present dangers, and giving us principles to apply so we could build upon a sure foundation.” Christ did not wish to exercise religious control through the charging of oaths, which if “violated,” result in a curse. Part of Christ’s ongoing instruction to individuals is revealed through personal encounters and the hearing of His voice. Saul, the persecutor of the Church, was spoken to by Christ and directed to a city in which he discovered his destiny – An Apostle of Christ. Annanias, a disciple in Damascus, was instructed by God’s voice to go and meet the acclaimed Saul of Tarsus at the House of Judas on Straight Street. Prophecy, which includes direction as well as affirmation, has the potential once acted upon, to ultimately become that individual’s collection of heroic and historical acts, which would also become their children’s divine inheritance. Jacob acted upon God’s voice and instruction and Israel emerged. We still feel the effects of his obedience today. Prophetic Image Expressions/Kim Clement has a global mandate to impact the world with Christ’s message of hope, using music and modern technology to cross cultural barriers and reach every continent. In 1979, Kim Clement was ordained by Christian Bible Training Center, Durban, South Africa where he was crucial in pioneering one of the first multi-racial, cross-generational churches. He has vast experience in dealing with the many challenges within the church and society in general. Through evangelistic crusades, prayer gatherings and clinics, Minister Kim Clement uses conventional and non-conventional methods to reach out to young and old alike, through the means of preaching, music, media and technology. Prophetic Image Expressions presents a life-changing message that brings hope and inspires millions. Our mission is to reach the unreachable and touch the untouchable through a message of hope, enrichment and healing haunting memories. Our call is to deliver this relevant message to the outcast, the rejected, dignitaries, religious leaders around the world, corporate chiefs and blue collar workers – young and old alike – regardless of social stature. Many of those, whom seek this message, are in despair, and often this message is their last hope. The message of hope, in its musical form, combines many genres of music. Whether it’s classical, folk, blues or jazz, the delivery of the message through music allows non-traditional followers to hear that there is One who loves them and cares for them. This alternative form of evangelism is rooted in the love and grace that Jesus Christ offered over 2000 years ago. * To teach the Body of Christ the various means of communication from God and how to decipher it. * To reach the unreachable and touch the untouchable through a message of hope and personal destiny. *To educate human beings who are reaching out to God, and seeking to improve their spiritual lives; We believe that the simple message of the Gospel, and the truths that Christ taught, are adequate for people to raise their standard of living and thinking and encounter a life-changing experience with God. *We believe that as followers of Christ, we must set expectations in every area of delivering the message of hope; In producing media based content (TV, DVD, and CD), we produce this message in a high graphics and high definition quality, that reaches those typically not served by the Christian community at large; This format has opened many atypical audiences, ranging from Capitol Hill, to MTV and from Wall Street to Main street. Technology allows us to deliver this message, night or day, allowing those non-traditional seekers to find the message of hope during their time of despair. Through regular meetings held nationwide, we also connect with these communities. The Commission Christ gave us allows us to go to Motown, Miami, New York, Chicago and Hollywood, and by means of the Internet, we can go to any city in the world. These meetings are streamed online for everyone to see, to maximize delivery of our mandate. We have seen that through music, media and technology, Prophetic Image Expressions/Kim Clement can reach the unreachable, touch the untouchable and give hope to those that despair; eventually fulfilling this mandate. Jesus said, “Seek first the Kingdom of God and His righteousness.” When Jesus taught the disciples to pray, He did not tell them to pray for the King to come, He told them to pray for the Kingdom to come. When Jesus sent the seventy out, He told them to heal the sick, to cast out devils, and then to announce that “the Kingdom of God is near you.” When He was approached by the Pharisees and asked “when the kingdom of God would come,” Jesus replied and said “The kingdom of God does not come with observation; “nor will they say, ‘See here!’ or ‘See there!’ For indeed, the kingdom of God is within you.” (Luke 17:20-21) These are the words of Jesus Christ. Bible prophecy teachers have exaggerated the strength and power of the beast and the Anti-Christ instead of teaching of Christ’s ultimate victory and greatness over the enemy, which is displayed throughout scripture, and reveals the consistency of God’s Character. He has always wrought victory over His enemies through HIS PEOPLE: Abraham, Moses, Joshua, David, Samson, Jonah, Gideon, Ruth, etc. I also believe that the book of Revelation could not possibly have been written for this final generation only. For us to believe that the book of Revelation was written for one generation is ludicrous. We cannot ignore the types and shadows throughout the Bible and what has possibly already been fulfilled throughout history. After all, they call Him the Lamb of God on the throne. We know that this is not a literal little lamb sitting on a throne. He has also been called a lion, so it is important to interpret these things with correct theological application. There are terrible things happening on the earth, but terrible things have been happening throughout history. There are wonderful things happening on the earth as well, performed by God, in order to reach the world, which Jesus died for. We cannot continue to focus simply on having ‘revivals’ in the church, while the rest of the world goes to hell. ‘Revivals’ in the church are great, but if they do not produce a demonstration of the Kingdom of God outside the four walls of the church, they are pointless. The world will not come to the church to get saved. The Church must go to the world, just as the light must penetrate the darkness. Jesus Christ never invited anyone to the temple to come and hear Him; He was usually thrown out of the temple. He touched people outside and in the market places. Teaching eschatology does not fulfill any of God’s present desires, for His greatest desire is to reach the lost. These “last day” teachings simply tickle the people’s ear’s and fill the wallets of teachers as they burden the people with certain events that are sure to happen, but they can never put a date, time or place on these events. Why not rather preach the purpose of God instead of the tribulations to come? If we discover our purpose in life, we become effective servants who are able to reach out to a dying world. Instead of standing on our pulpits with moral measuring rods screaming curses at this sinful world, we should be building altars in the presence of unholy people, and offering Him praise. We should be offering Life and Living Water to an adulterous woman instead of gazing at her with lustful eyes, and then stoning her later. We should be filling fishermen’s nets with fish, and then presenting the truth to them, instead of shouting about the potential evils of their “great catch.” We should be met by demoniacs and lunatics at the entrance of a City, instead of being hailed by the politicians with red carpets. We should be commissioning new converts as the missionaries to the same regions where they were delivered, instead of indoctrinating them with irrelevant patterns and forms of religion, and then sending them to the “mission field.” We should be expelled from the religious centers and temples, for identifying the true enemies, (Luke 4:16-29), instead of being exalted as celebrities because of our “cliché preaching”. It is time to follow Jesus, not only as we see Him in history, but also as He is presently revealing Himself. Where is He moving today? What is He saying? Where does He want us to go and what does He want us to pray about? He may lead us to some unusual places, but we must go. I believe the only way for a person to be saved is through the name of Jesus and by confession that He is Lord. The only way to the Father is by accepting the sacrifice that His Son made by shedding his blood. John 3:3- When Nicodemus approached Jesus and commented on how he recognized God was with Him, His great miracles, and for being a great Teacher, Jesus responded to him saying you must be born again to “SEE” the Kingdom of God. The next step is to “enter” what is seen. Jesus did not say that “you must be born again” to be saved or to escape from judgment. In fact, in the New Testament you will not find examples of Christ or His disciples instructing and warning the crowds to get “born again” in order to be saved. From what scripture reveals, it is possible that Jesus did not even use this same terminology again when teaching about the Kingdom of God. Teaching eschatology does not fulfill any of God’s present desires, for His greatest desire is to reach the lost. These “last day” teachings simply tickle the people’s ear’s and fill the wallets of teachers as they burden the people with certain events that are sure to happen, but they can never put a date, time or place on these events. Why not rather preach the purpose of God instead of the tribulations to come? Men like this have not come into the kingdom of God through theology, or the true gospel. They have not come in at all. They despise the institutional church, which, for all its error and legalism is at least in many places keeping the flame of the full counsel of God alive, and they focus instead on New Age teachings, Emerging church language which is filled with words which appeal to the mystics and charismatics in the church, and occult experiences which do not bring the much needed fruit of the Spirit, but the works of the flesh. I am in no doubt at all as to the spirit which is behind this man. Avoid him at all costs. Anita Brady, you have absolutely no right to judge another christian brother in public the way you have here. You don’t know Kim Clement, you are not around him nor have you obviously ever prayed with him. So you have no right judging another christian brother or sister. The Lord says VERY CLEARLY not to criticize another christian… especially publicly. If Kim Clement is wrong the Lord will let him know… you can be sure of that. There is nothing “New Age” about Kim Clement. Just because you happen not to like the way he handles his ministry doesn’t give you the right to openly criticize him without absolute proof of his, or anyone’s, shortcomings… or his “deceptions” as you have implied here. You may as well slander him completely by calling him an outright liar and thief… it wouldn’t be much different from what you’ve already insinuated. I don’t know whether Kim Clement is an actual prophet sent by God or not… neither do you! But I do know for a fact Kim Clement loves God, has spent most of his adult life trying his best to serve God by helping people, and if he is spreading untruths God will surely deal with him. Did God die, or leave his throne so he could pass it on for you to judge mankind? You remind me of those sometimes arrogant, puffed-up “answer people” radio types who are full of the [academic] knowledge of the gospel, but who almost completely “deny the power thereof”. Jesus warns of being a verbal stick-in-the-mud and not being filled with the spirit and allowing God to move through us in signs, wonders and miracles. So, why do people like yourself constantly concentrate on God’s judgement, yet you seem to deny the power he gave us through the Holy Spirit? Some of you actually believe it is God’s will that his people be sick and miserable while on this earth! Sorry… I don’t read that anywhere in the Bible. Notice the above scripture states “my people are destroyed”, not the “world’s people” — not non-christians or “heathens”, if you will! Jesus even said if a brother is doing wrong, go to him privately and seek to make him aware of it and heal him of his nonsense. Even after confronting him several times God says to simply leave him alone if he/she will not listen, and have as little as possible to do with him. He NEVER says to publicly humiliate and/or tell others how bad you “feel” the person is. God’s words, NOT mine! This is a time when ALL christians should be coming together… the world is not getting any nicer toward ANY of us. God even warns NOT to say anything publicly about another christian brother or sister, unless you know absolutely for sure they are only serving themselves and using God as a means to benefit themselves in some way by manipulation of people and/or God’s word. Open your spiritual mind to the entire gospel of Jesus and our Father’s word… not only to what you “feel” his word to be. God judges, we are not allowed to. You may judge for yourself… but you should keep any resulting negativity to yourself unless, like I already stated, you absolutely know different. It’s all sowing and reaping. If you plant grapes you cannot expect to receive a crop of cherries or apples! It’s that simple. God created this world based on the principles of sowing and reaping. It is his natural law for mankind. Christian’s don’t stand with liars, thieves and frauds D.H. Why are you defending the very people Christ himself warns against in Matthew 7 and Matthew 24? How can you call yourself a Christian when you elevate the men above God and demand love with their is no truth in those who you are defending? We all need to pray for each other and ask God to sent us his sprit to us so we All will know the truth!! He will and stop judge people and beening mean to each other and judging!! If you think Kim Clement is a fuse prophet Stop watching him or listening to what he says. We would rather do what the bible says, mark him, watch him, avoid him, expose him and warn others to the fact that he preaches things contrary to what Christ and His Apostles teach. God commands us to do that. It is wrong to turn our back and ignore him.